Performance wise all the inks are pretty wet and well lubricated, with Sydney Habour being possibly the wettest. They all sheen decently on Tomoe River around the edge of the letters with Barrier Reef being the strongest sheener. They don't bleed of feather on fountain pen friendly paper and they are not water resistant at all. None of the ink produce a halo affect. Sydney Harbour Blue is the darkest of the lot. Almost a blue-black with a good lean towards green (though not as much as those to come). This is a lovely rich colour but it doesn't shade as well as Barrier Reef. In a drier pen you can coax some nice shading out, however. Blue Gum is very much in the middle, hue-wise, between Sydney Harbour and Blue Cypress; greener than Sydney Harbour and Bluer than Blue Cypress. It's not a very vibrant ink and it's lighter than Sydney Harbour but darker than Barrier Reef. Again, not that much shading on this one. Blue Cypress I wouldn't call a blue. For me it definitely sits as a green; a green that leans somewhat blue but still a green. This is the worst shader of the group with very almost not shading. Of the four inks, Barrier Reef stands out is very different from the others which seem to be siblings or at least cousins. 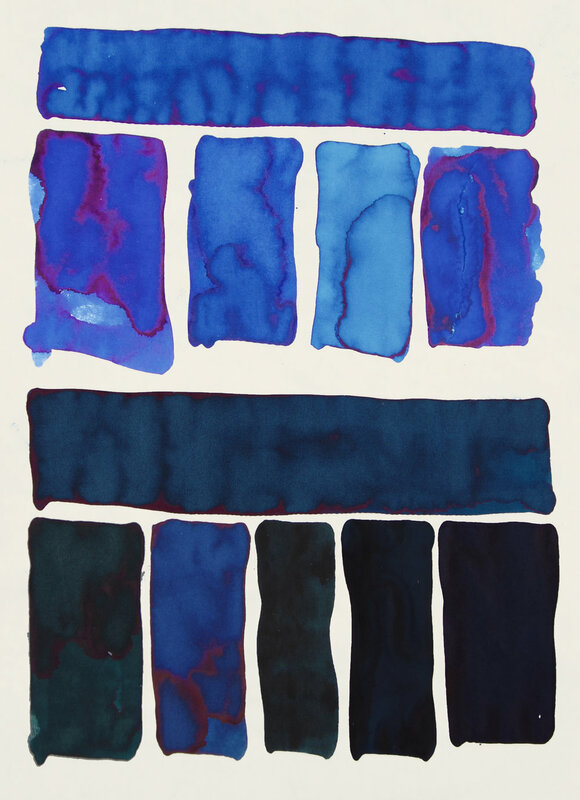 All four inks are lighter on Tomoe River, and, unsurprisingly, have more sheen. In my experience Tomoe River tends to lower the shading but it hasn't really done that here. Some pretty strong shading with Barrier Reef and Sydney Harbour does pretty well here too. Blue Cypress gets even greener as well. The inks lose contrast and vibrancy on both Leuchtturm1917 and Clairefontaine paper. Almost no sheen from any of the inks and they look very flat with these papers. On my Card Stock they look fairly similar to how they look on Tomoe River. Barrier Reef: Sailor Souten, Noodler's Midway Blue, Robert Oster Blue Lagoon, and Sailor Kobe No. 58 Hyogo Canal Blue. Sydney Harbour Blue: Private Reserve Ebony Blue, Iroshizuku Tsuki yo, Noodler's Aircorp Blue Black, KWZ IG Turquoise, and KWZ IG Blue No. 6. 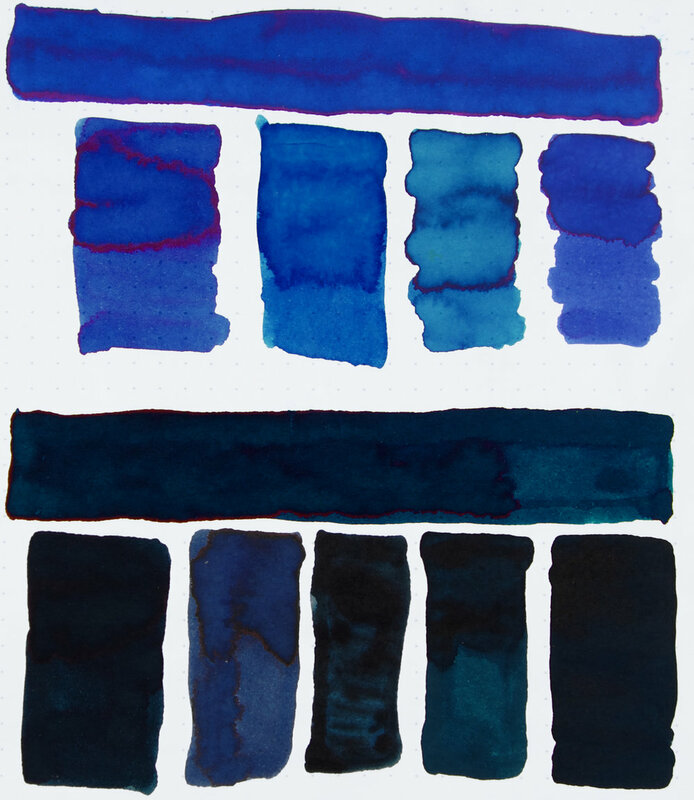 Four inks I found to compare to Barrier Reef (first horizontal swatch) are, from left to right and below the Barrier Reef Swatch, Sailor Souten, Noodler's Midway Blue, Robert Oster Blue Lagoon, and Sailor Kobe No. 58 Hyogo Canal Blue. The two Sailor inks compare pretty well but have slightly less of a hint of green. Midway Blue works well with when Barrier Reef shades lighter but is too light overall as is Blue Lagoon but even more so. 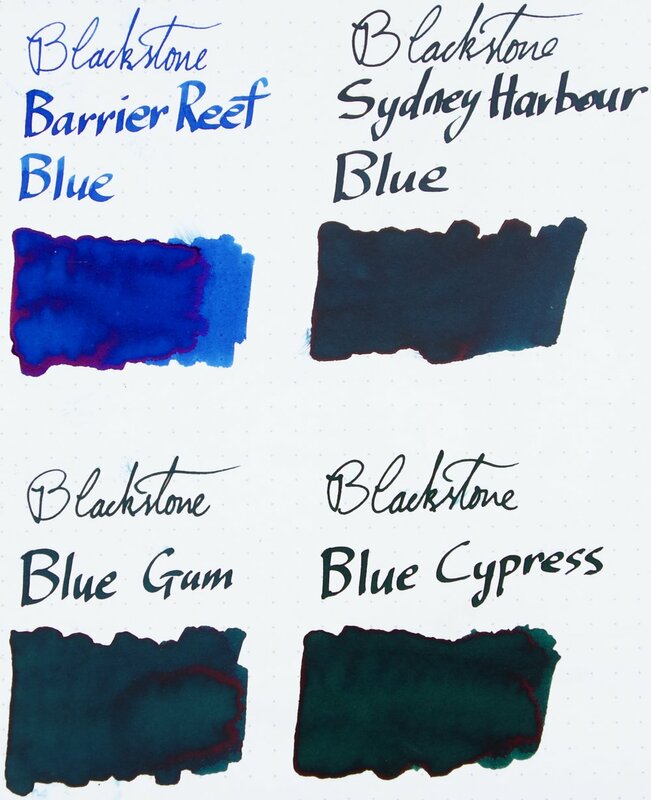 The ink that I have compared to Sydney Harbour Blue (second Horizontal Swatch) are Private Reserve Ebony Blue, Iroshizuku Tsuki yo, Noodler's Aircorp Blue Black, KWZ IG Turquoise, and KWZ IG Blue No. 6. Ebony Blue is too dark and too green, Tsuki yo is too blue but a decent match darkness-wise (thought still too light), Aircorp Blue Black is too green and too dark. IG Turquoise does well enough with approximating the right levels of blue and green but isn't as vibrant and is a little too dark, and IG Blue No. 6 is way too dark and not green enough. 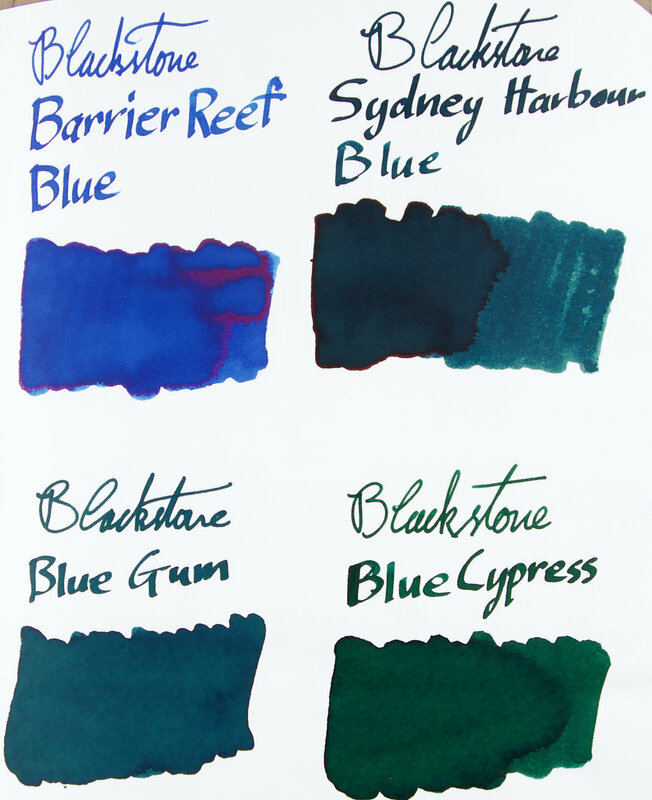 For Tomoe River Barrier Reef compares to the other inks as it did on Rhodia except for Midway Blue Fairing much better. As Barrier Reef is lighter on Tomoe River it matches the lighter colour of Midway Blue, which did not get lighter, much better. As with Barrier Reef, Sydney Harbour also compares similarly to how it did on Rhodia with an exception being IG Turquoise being much darker and no longer being decently similar. Blue Cypress: Waterman Mysterious Blue, Robert Oster Deap Sea, Private Reserve Blue Suede, and Robert Oster River of Fire. Back to Rhodia for Blue Gum (top horizontal swatch), the inks I have compared are Sailor Yama Dori, Private Reserve Blue Suede, Noodler's Coral Sea, and Maruzen Athena Eternal Blue. All the inks are less vibrant than Blue Gum. Yama Dori is too green and noticeably sheenier. Blue Suede is pretty close regarding vibrancy and isn't too far off in colour but is still a touch greener. Coral Sea, a discontinued Australian exclusive Noodler's ink, is very unsaturated here and doesn't compare well at all. Eternal Blue is probably has the closest hue to Blue Gum but isn't as vibrant and is a flatter colour. For Blue Cypress (second horizontal swatch) I have compared it to Waterman Mysterious Blue, Robert Oster Deap Sea, Private Reserve Blue Suede, and Robert Oster River of Fire. Mysterious Blue is too light, and unsaturated and much less vibrant. Deep Sea is the closest comparison but is a little too green. Blue Suede, this time, is too blue. River of Fire is much greener but is a similar darkness. On Tomoe River Blue Gum is quite a bit lighter so this time Blue Suede is the closest colour though lighter. Yama Dori compares well (if you can see it with the level of sheen on display) but is darker. Coral Sea comes alive on Tomoe River; it's a bit splotchy and some of the splotches are comparably green but overall it is too dark and too blue. Eternal Blue got darker so doesn't compare as well anymore. For Blue Cypress, Mysterious Blue and Blue Suede compare similarly to on Rhodia but here River of Fire compares a bit better with it losing some saturation bring it a touch closer to the colour of Blue Cypress. Deep Sea is now, strongly, not green enough! But it still compares pretty well. Blackstone Barrier Reef is definitely the sheeniest of the bunch with the other three being comparably sheeny to each other. There are different types of sheen and the sheen that appears with these inks occurs on the edges of the written line. The colour of the sheen is a shiny bright pink sheen. Sydney Harbour, Blue Gum and Blue Cypress are a little redder in colour than the pinker sheen of Barrier Reef. Blackstone fountain pen ink is packaged in reusable Polypropylene bottles. Polypropylene is one of the toughest plastics in existence and these bottles are practically indestructible. These bottle can be re-purposed as ink carry or storage bottles and Polypropylene is completely recyclable.. Fountain pen ink is traditionally packaged in glass bottles which are expensive to manufacture, heavy to ship and break easily. Which makes it understandable but doesn't make it prettier! Apart from these 30ml polypropylene bottles they also come in 60ml of the same type of bottles and 50ml bags. And if you really like one of the Colours of Australia inks, you are in luck because they also offer 250ml or 1000ml bottles! I have to admit that I am tempted just so I can say I have a litre of an ink (and I really do like Sydney Habour and Barrier Reef). I make no secret of the fact that I do not like green leaning blues so Blue Gum and Blue Cypress aren't really for me. The Darkness of Sydney Habour Blue, even though it leans green, gives it a character that I do really like. I love Barrier Reef Blue as well. I've heard reports that some of Blackstone inks have become crusty in a pen when left in it a while. I haven't experienced that with these inks though it did happen for me with their green Scents of Australia ink Australian Bush. This didn't make it difficult to clean but it was unsightly on the nib and it did only happen when I had left the pen for a while without use. I think these are great inks and I recommend trying them out if you get a chance. You can find these inks in the US from Lemur Ink and Anderson Pens (both sets for both stores); in Australia from the maker Just Write; from Appelboom in the Netherlands (both sets) from Bureau Direct in the UK (only Colours of Australia).